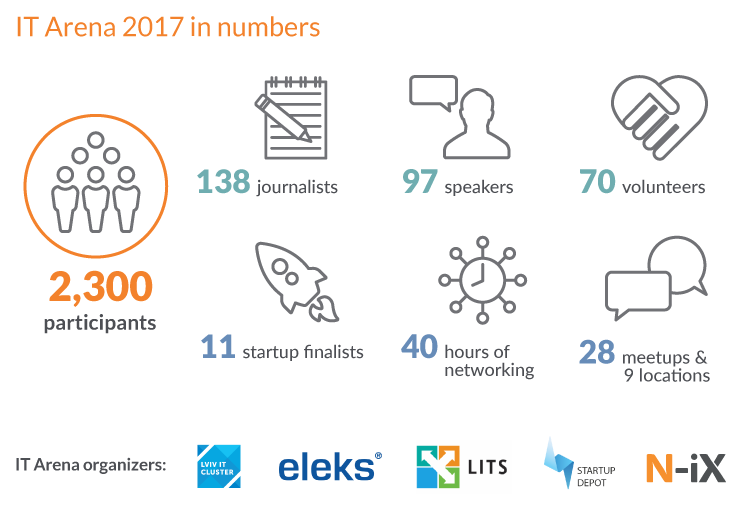 IT Arena 2017, one of the biggest tech conferences in Eastern Europe, took place in Lviv during September 29 – October 1. The event brought together 90+ outstanding speakers, 100 startups and 2000+ IT devotees including top managers of the biggest IT companies, software developers, designers, project managers, business analysts, investors, entrepreneurs, IT students, and government officials. The conference was filled with the atmosphere of bald innovations, smart technologies, and strategic business initiatives. One of the pivotal topics of the event was taking the joint effort to popularize and project the Ukrainian IT image on the world map. 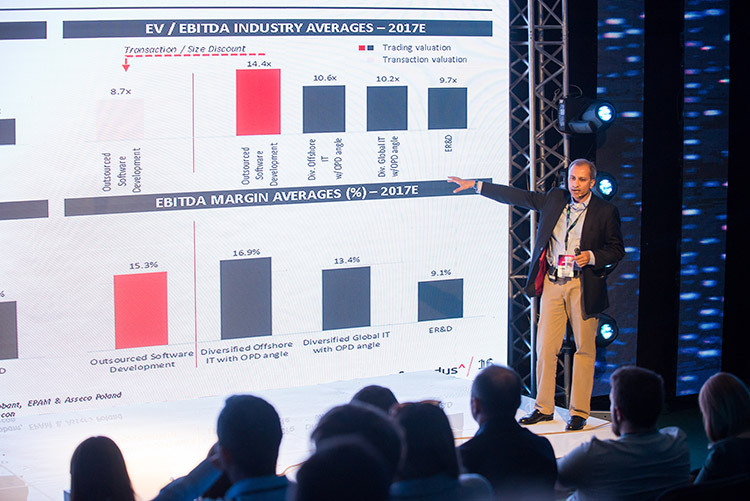 Lviv IT Arena gathered some of the most renowned experts and industry leaders for sharing ideas, networking, and candid discussions. 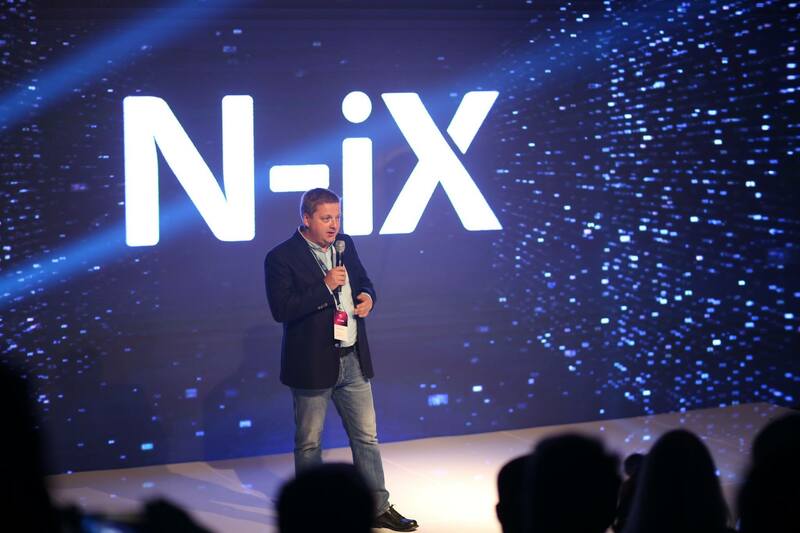 This year N-iX was proud to co-organize the event which reflects our shared vision of the future and the need for constant growth and improvement. N-iX has contributed to all the three streams and invited great speakers from multiple industries and technology domains. An unexpected yet memorable host of the 2017 conference was Arina, an AI prototype whose voice evoked the images of the looming robotic future. Arina opened the event and presented the organizers who gave their rousing speeches: Stepan Veselovskyi, Lviv IT Cluster CEO; Andrew Pavliv, N-iX CEO & Co-Founder, Supervisory Board Chairman at Lviv IT Cluster; Ruslan Zakharchenko, Eleks CEO; representatives of Lviv IT School and Startup Depot; partners and sponsors of IT Arena. The speaking sessions traditionally comprised 3 streams: Business, Technology, and Product. The business stream highlighted the key challenges and opportunities of the global IT market, and Ukraine’s place in it. The stream kicked off with the speech by Kerry Hallard, President of the Global Sourcing Association. Kerry Hallard outlined that customers demands are growing exponentially, and the market becomes more competitive and volatile. She pointed out that the key things buyers want from their providers include: reliable ongoing access to qualified talented specialists and proficiency in services beyond the core ones. Kerry Hallard accentuated the importance of trust and transparency for building a viable long-term business partnership and highlighted the need to work very collaboratively with service providers and vice versa. To make the country more competitive with India and Poland, she recommended to consolidate the effort and enhance the global image of the Ukrainian IT industry. As a logical continuation to Ms. Hallard’s speech, a heated and frank discussion on how to make Ukraine the top IT outsourcing destination took place. 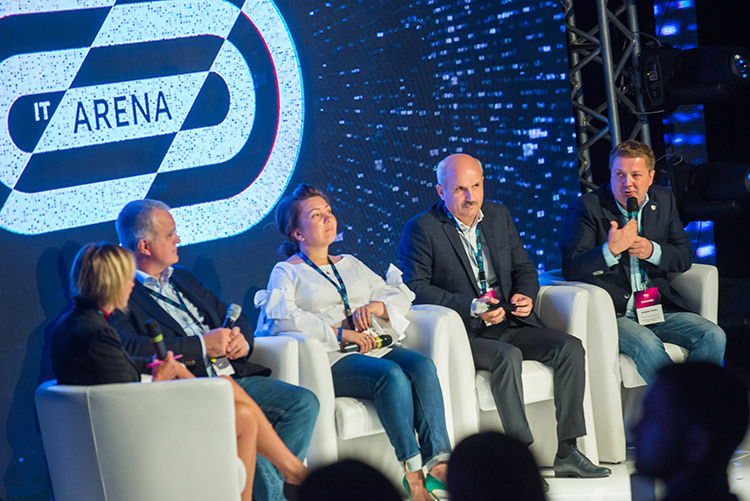 Its participants were Kerry Hallard, Oleksiy Skrypnyk (Member of the Ukrainian Parliament), and the leaders of the prime IT companies in Ukraine: Andrew Pavliv (N-iX); Taras Kytsmey, (SoftServe); Marina Vyshegorodskikh (Ciklum). The speakers were discussing some of the key challenges which at the same time open ample opportunities in the IT industry such as digital transformation in various domains. They noted that the need to implement the latest trends and help other companies undergo digitization challenges them to engage top professionals and obtain more expertise in advanced technologies and innovative areas. Also, the members of the discussion talked about the importance of promoting IT in Ukraine and Ukrainian IT in the world. They outlined that the leading IT companies in the country need to unite their effort and shape a powerful and appealing brand of Ukraine, giving it a unified voice and presenting the country at global tech and business events. Another notable business stream participant, Deepak Bhandari, Head of European Operations at Avendus Capital, gave a presentation on custom software development, key drivers of mergers and acquisitions in the OPD sector, the key valuation metrics, and more. The speaker outlined the growing importance of vertical focus knowledge and pointed out that digital engagements and transformational work present a grand opportunity for outsourcing service providers. Yuriy Kushla, Delivery Director at N-iX, spoke on the key factors of success and effectiveness in big outsourcing. He accentuated the importance of building the company vision which brings people together. 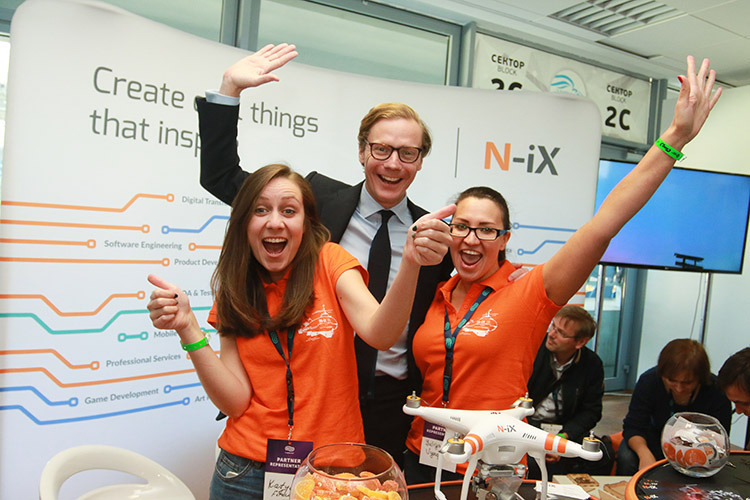 Alexander Nix from Cambridge Analytica who evokes ambiguous feelings all around the globe, was one of the most awaited speakers of IT Arena 2017. He gave a keynote speech on leveraging Behaviouristic analysis, the OCEAN scale of personality traits, and Big Data to produce customized messages which different groups of people are willing to hear and respond to. Alexander Nix elaborated on how to turn big data into smart data, how to act in the era of personal relationships with brands, and how Cambridge Analytica contributed to Trump’s presidential campaign. The technology stream speakers dwelt on the latest trends in Big Data, AI, Machine learning, Deep Learning, 3d Biofabrication, Wearables and IoT, VR, Blockchain, and more. Blockchain Architect and Consultant at iov42, David Acton, gave an illuminating speech on the difference between distributed ledger systems and blockchains, the challenge of scalability, and the future directions of blockchain development. Dmitri Lisitsky, Influ2 CEO, spoke on AI and privacy. Also, he discussed how data can help businesses predict their customers desires and make their offerings more personalized and better targeted. The product stream featured such big names as Martin Ericsson, from Mind the Product, Jonathan Vella, from Hotjar, Ragnar Sass, from Pipedrive, and many more. The stream focused on introducing new approaches to delivery, team composition, and project planning. It emphasized the importance of listening to your employees and clients, understanding that your needs may differ from the needs of your target audience, types of transformation you should undertake, importance of data and analytics in product design, etc. The startup competition was held on the second day. More than 100 startups from different countries applied for the competition. As a result, the best 11 were selected: Senstone (Ukraine), Bright Advise (Ukraine), GameTree, BotMakers (Ukraine), EVE.Calls, Octogin, Cards, CertChain, AxDraft, Docsify (Ukraine), and IRAengine (Ukraine). The winner of the Best Pitch category was IRAengine. The Best B2C recognition went to Senstone, and Docsify was chosen as the Best B2B startup. After the presentations and formal discussions were over, the participants and guests of the conference could relax and feel the incredible music vibes of the afterparties. The musical highlight of Lviv IT Arena 2017 was the open air Futureland Festival which took place on the second day of the conference and gathered 2000+ electronic music lovers. The third day of Lviv IT Arena was a bit unusual this year. It featured 28 invigorating meetups in 9 cafes in the city centre where the guests could have coffee, listen to the speeches, and network in a cosy atmosphere. 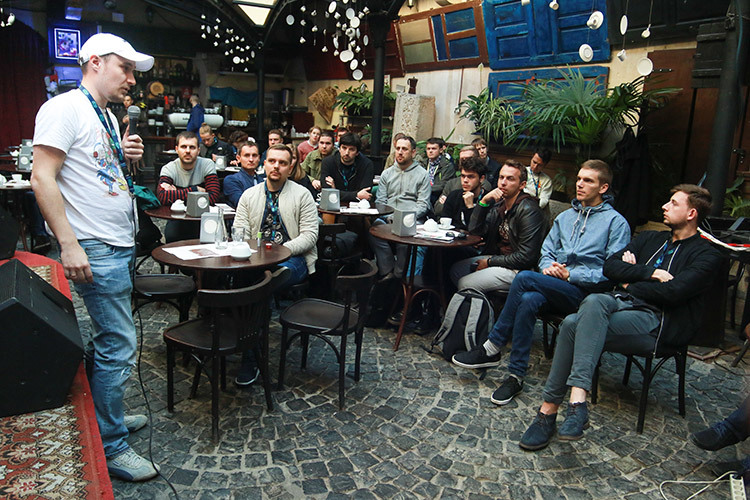 At one of those meetups, Daniel Poludyonny, GameDev Delivery Manager and Project Manager/Designer at N-iX gave an exciting speech on the actual cases of virtual reality development at N-iX. IT Arena has proven to be a great example of an event which promotes and propels development of the IT industry both within the country and on the global market. One of the key questions it raised was combining the effort of leading IT companies to popularize Ukraine at global tech events and make Ukraine the top IT outsourcing destination.